Do you have a passion for emerging technologies with a knack for identifying trends and conceiving innovative solutions? Come join us to work together on strengthening our ties with the Deep Learning research community! Be part of a dynamic multidisciplinary team that works with academic and industry customers around the world to advance the design of complex engineered systems. Help us with technology transfer and adoption while providing guidance on research directions that have industrial relevance and impact. Gain insight into industry needs and provide guidance to the research community with publications, presentations, as well as deep technical engagement. Contribute to the research community by organizing special sessions, panels, industry talks, grand challenges, and special issues. Accelerate research by creating and promoting case studies, benchmarks, interfaces, and prototype solutions. Work directly with development engineers to implement relevant product capabilities. Help articulate key needs for research customers and provide subject matter expertise to guide the direction of and contribute to our long-term technology roadmap. Champion collaborative projects between thought leaders and MathWorks development engineers. Identify advanced technology needs and conceive innovative solutions to strengthen our intellectual property portfolio. Ph.D. and two years of postdoctoral experience. Experience with Robotics, Deep Learning, and/or Automated Driving research. Significant publication track record in research. Experience in organizing the research community. 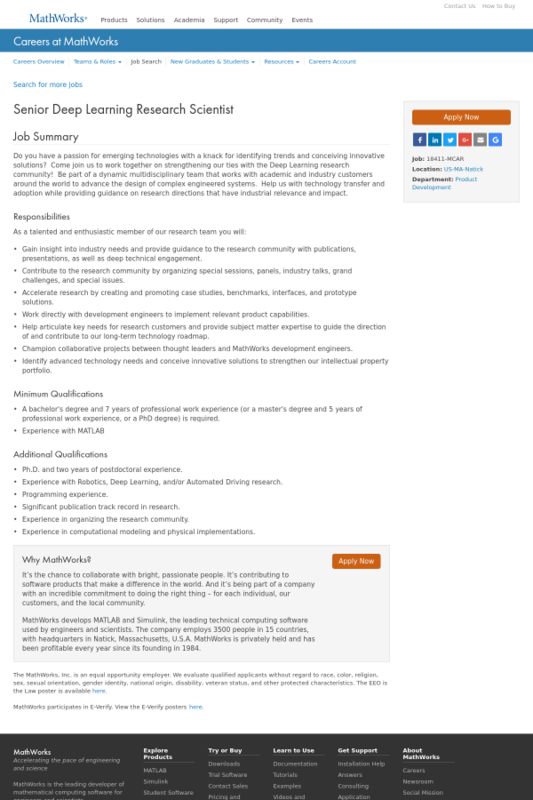 Experience in computational modeling and physical implementations. MathWorks develops MATLAB and Simulink, the leading technical computing software used by engineers and scientists. The company employs 3500 people in 15 countries, with headquarters in Natick, Massachusetts, U.S.A. MathWorks is privately held and has been profitable every year since its founding in 1984.